Come visit our new Carroll Gardens home! 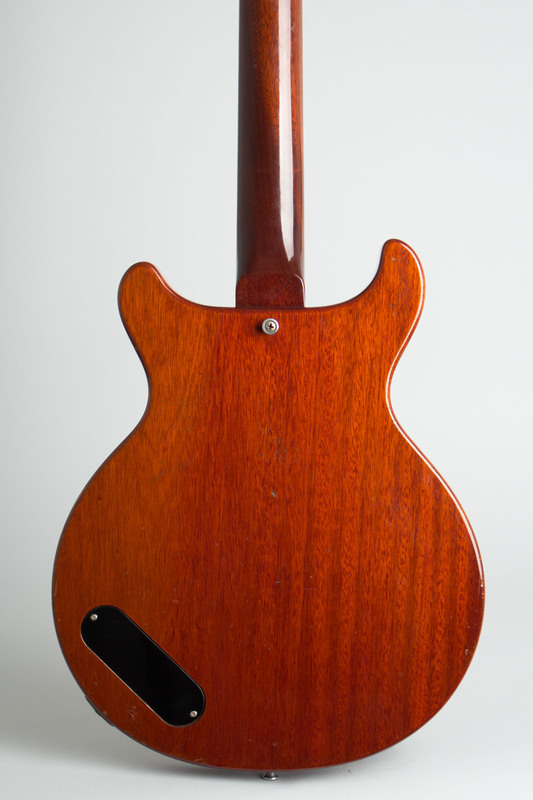 Gibson EB-0 Model Solid Body Electric Bass Guitar (1959), made in Kalamazoo, Michigan, serial # 9-2140, cherry lacquer finish, mahogany body and neck, rosewood fingerboard. 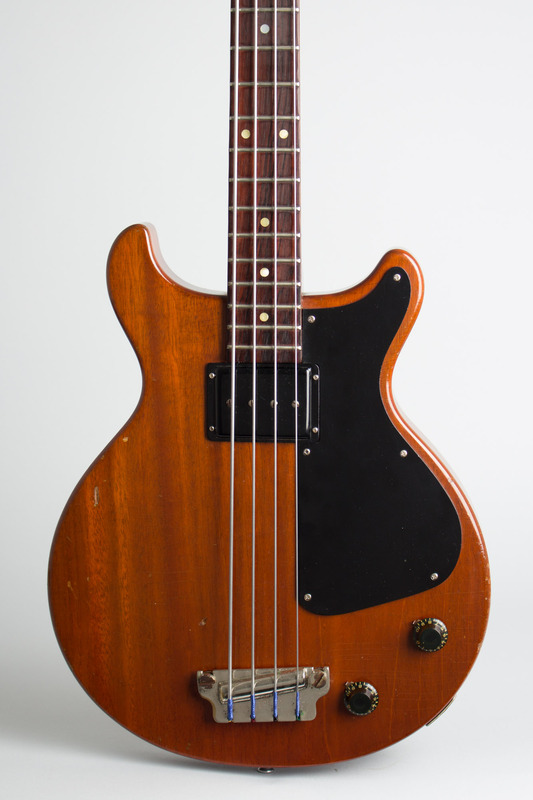 The first-year Gibson EB-0 bass is a fairly rare instrument, as only about 500 of this early slab-body variant were sold from 1959-61. This particular example has a low 1959 serial number and is likely from one of the very first batches produced. The 1959 shipping totals show a paltry 123 instruments leaving Kalamazoo that year, so there are not a lot of these basses out there! The EB-0 was Gibson's first "popularly priced" bass, listing on introduction at $195 and replacing the more elaborate and expensive violin-body EB-1. 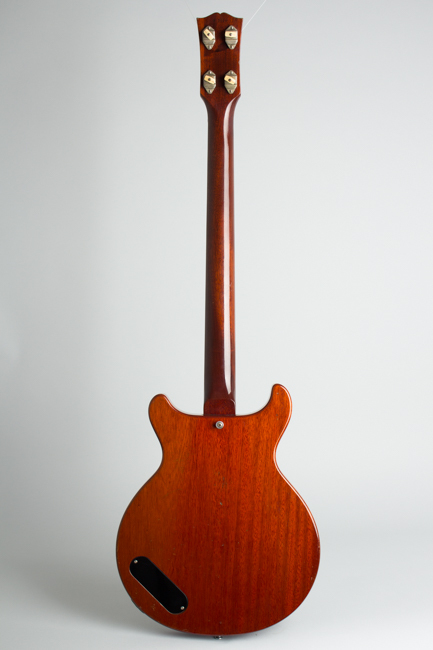 The new "0" used the same cherry finish, double-cutaway slab mahogany body as the Les Paul Junior, mated to the 30" scale bass neck and hardware continued from the EB-1. Some logically refer to these as "Les Paul Jr. Basses", but they were technically never part of that signature line. 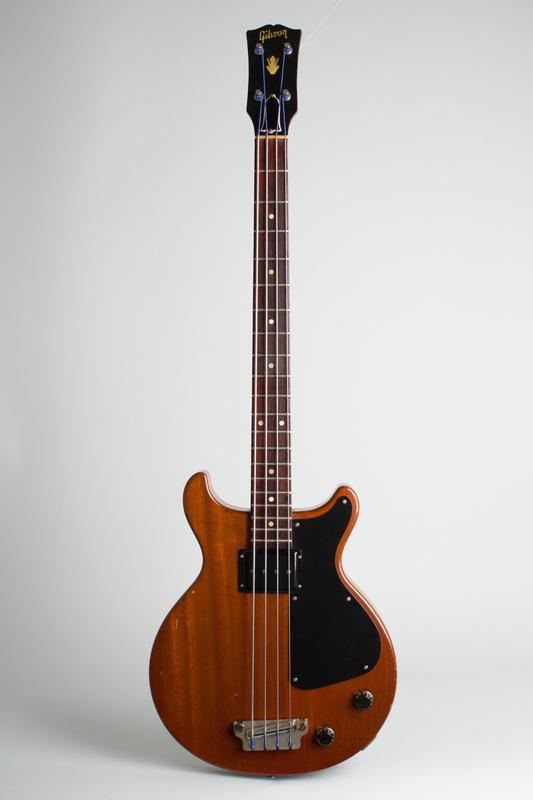 The features include the earliest version of Gibson's infamous 12,000 turn bass humbucking pickup with a black Royalite cover, hovering over a large black single-ply pickguard covering the lower half of the body. 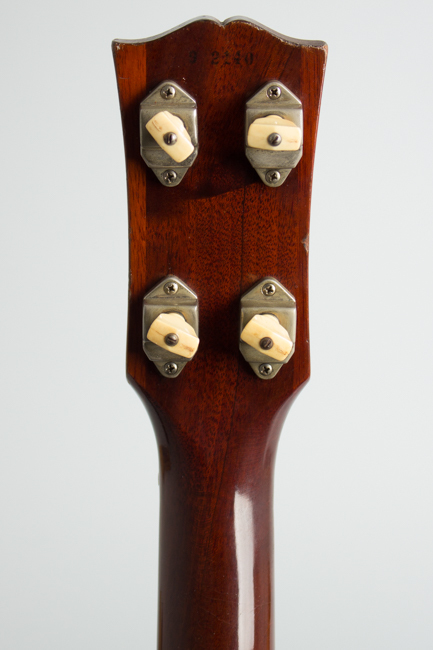 The nickel-plated one-piece metal bridge at the bottom end of the body is adjustable for height and overall intonation, and this primal model is devoid of the clutter of a central handrest and bridge mute unit added to its SG-bodied descendant. The headstock carries the plastic-button Kluson banjo tuners Gibson inexplicably preferred for bass use up into 1960, with a pearl Gibson logo and crown inlay. The chunky round-backed mahogany neck is typical 1959 Gibson fare, and very comfortable to play. The sound is typically huge and booming, centered on the lower end of the tone spectrum with a massive overdrive potential through older-style tube amps: think Felix Pappalardi, Jack Bruce et. al. 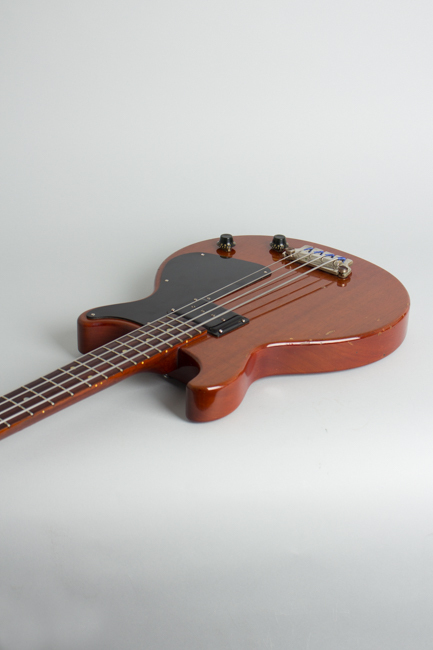 This is a very ergonomic bass, extremely compact with a simple layout and no wasted space! While the sonic palette is very specific, this is a great-playing and far superior-feeling bass to the many later 1960s and '70s Ebs far more commonly found. Overall length is 40 1/4 in. (102.2 cm. ), 13 1/8 in. (33.3 cm.) wide at lower bout, and 1 3/4 in. (4.4 cm.) in depth, measured at side of rim. Scale length is 30 in. (762 mm.). Width of nut is 1 3/4 in. (44 mm.). This is a nice original example overall, with some general wear but no major damage or alterations. 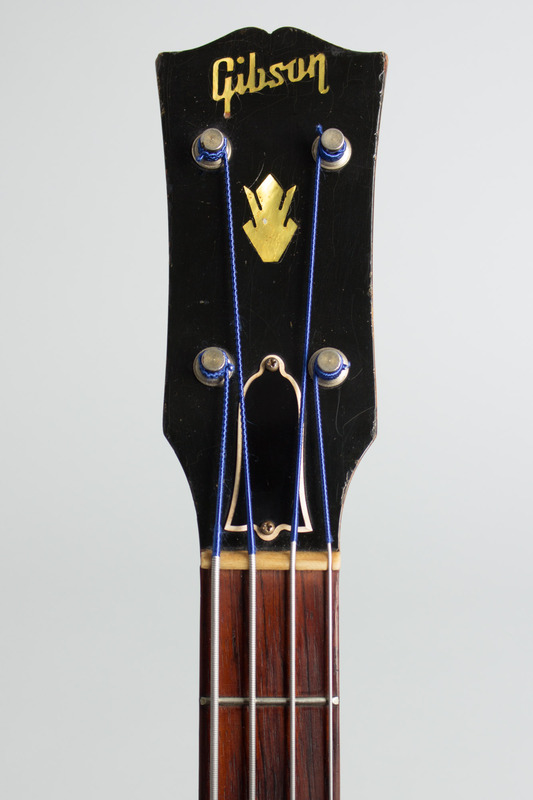 The sometimes fragile plastic-button banjo tuners are still present and working, as are the giant "mudbucking" black-plastic covered pickup, wiring, knobs, bridge, and pickguard -- even the usually broken plastic jackplate is still intact. There are some deep dings to the finish, which has also faded and checked but has no major areas of loss. 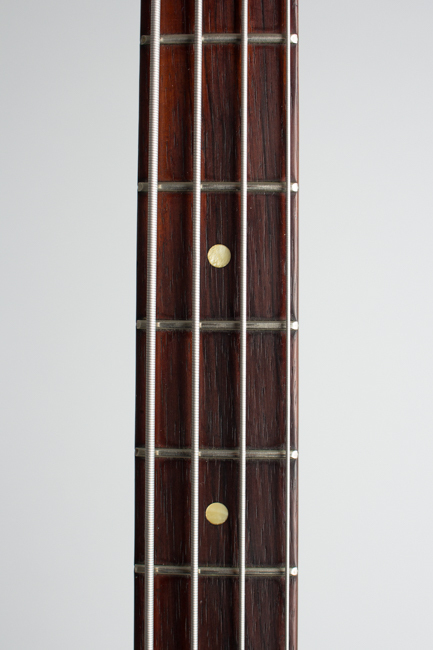 The bass plays perfectly, with almost no fret wear and a very straight neck. The sound is BIG and dark with very little high end. If you are looking for the ultimate monster Gibson miles-deep bass rumble, this has it in spades -- and is actually much more versatile through modern amps than period ones. Excellent - Condition.